MiniTool Power Data Recovery (Free) is a Free Partition Recovery & Data Recovery Software that helps recover deleted, lost or damaged logical drives and partitions on Windows, then recover data from them. Recover lost, deleted or damaged partitions from IDE disk, SATA disk, SCSI disk and Removable disk, supporting FAT12, FAT16, FAT32, VFAT, NTFS and NTFS5 file systems. Recover lost and deleted data from hard drives, USB drives, and nearly every kind of disk or directory that can hold (and lose) data. Supporting image, audio, music, email and text recovery. Minitool Power Data Recovery (Free) is for private, noncommercial, home computer use only. 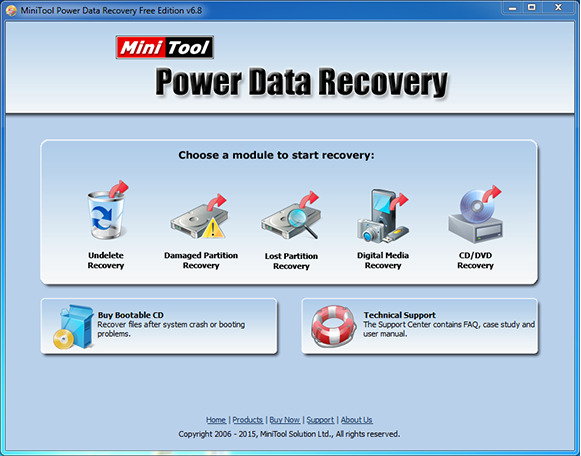 Use of Minitool Power Data Recovery (Free) within any organization or for commercial purpose is not allowed. Author : MiniTool® Solution Ltd.